No matter what size a company, whether creating a new brand or rebranding an existing one it can be one the toughest projects a company can go through. The stakes are very high and implementing this initiative successfully is incredibly important. Breaking down all of the objectives that encompass branding is key to keeping your head above the water. There are many cross-functional teams that will be part of the project, and it is the marketing and creative departments that will take the lead. This means your proposals need to be visual whenever possible because most people have difficulty visualizing. Write in bullet form and spell everything out, so everyone understands the important decisions that are being made. These decisions will be the corporate commitment for years. Before you start you need to know the purpose and reason for the rebranding. Usually, it is because the company has evolved and grown or the audience has changed. Broadening and revitalizing a brand needs to be calculated. You must do your homework and be self-aware. Give your brand a story and find out what makes your product or service resonate with your audience. If you have brand equity, be sure not to over-do the changes and make something your audience no longer recognizes. Remember back in 2010 GAP created a new logo? If you don’t remember, it’s because the new logo lasted only six days. It was so negatively received they had to backtrack and revert to the old logo. The launch became a road map to what not to do and cost the company $100 million. Rebranding is not for the timid. Be prepared for obstacles and allow for corporate growth. Ideally, you want this to last. I have already written several articles on this subject and recommend you read them for more details before starting your initiative. 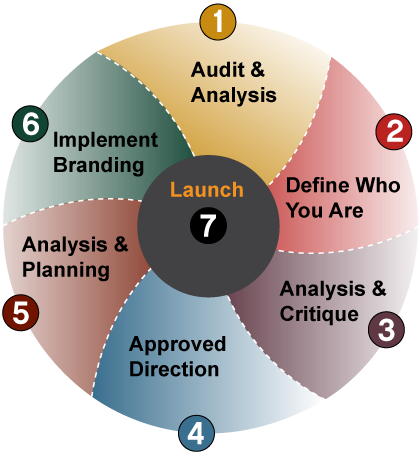 As a leader of numerous branding initiatives having a comprehensive plan is not enough. There are bound to be issues with your branding system or with differing opinions from your team. How you adjust to these challenges will determine the success of the project. I always say, “choose your battles” and be open to compromise. There is no such thing as the perfect brand. At some point if not at the start you will need to go outside your defined brand structure. Just don’t let customers bastardized your brand. Their opinion matters but every company need to stay true to what they believe is right. Exceptions are acceptable but keep them to a minimum.